YOUR POOL OF INVESTORS JUST INCREASED BY 2 BILLION . . .Since the day the first human being approached a prospective investor, the province of capital allocation has been controlled by a small and entrenched minority.All this has changed. Now, the power of the Internet—particularly social media—enables anyone to connect with more investors in less time than it used to take to connect with one. The investing pool is open, everyone is in—and The Crowdfunding Revolution shows how to get to the forefront of the new world of venture financing.This groundbreaking guide explains how the explosive growth of connectivity is obviating human-to-human networks and centralized planning of capital allocation—and describes how crowdfunding can be used to tap into a “collective intelligence” for far superior results. More than 2 billion people globally are now active online—and that number is guaranteed to grow at an extraordinary rate. The Crowdfunding Revolution explains all the ins and outs of raising investment capital by using social media and new technologies to draw small sums of money from an almost countless number of sources. Organic. Transparent. Decentralized. This is crowdfunding. This is the future. 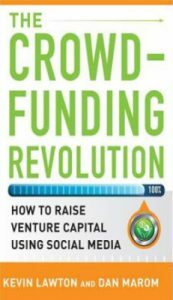 Read The Crowdfunding Revolution and become the first expert in your crowd on this radical new approach poised to supplant age-old venture financing methods.